Stitchery! Sewing Machine Attachments, Needle, and Thread: Opal Mylar and the new colors! Opal Mylar and the new colors! Love to experiment with new sewing items. Sharon of Heirlooms by Sharon is now carrying the colored Mylar - and in some fun neon colors! After receiving my order, I headed to the sewing room to see how they sewed up compared to the opalescent mylar. Something to remember when using the colored mylar is durability. The colors are not processed right into the mylar, as in the opalescent. Given that, recommendations are to use them for items that will not get laundered, like your totes or maybe some quilt art. Some of the colors still have the shimmery shine through your design. Yet some give a very neat color, but without the shimmer. Like appliquéing with foil. 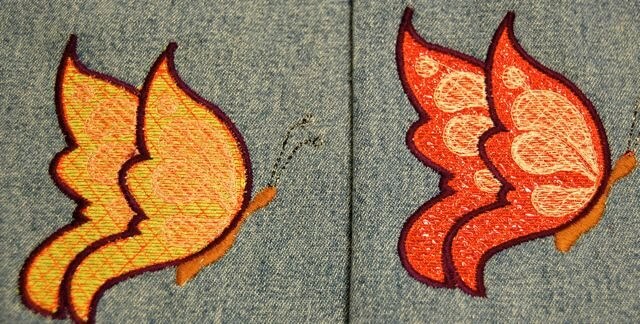 I tested the same embroidery design from Dream West Embroidery Designs. Love the butterflies she creates. 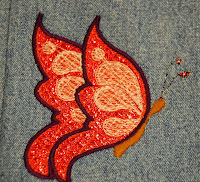 The shimmer shines through the red butterfly! Hard to see in the picture. The neon yellow may not shimmer but really gives the butterfly a nice color! Instead of appliquéing with fabric, try the mylar. You will be amazed at the many colors - teal, purple, neon colors, and so many more!